This quaint traditional property is situated in a quiet and picturesque hillside setting in the exclusive award winning resort of Kamares Village. Nearby is the popular Kamares Clubhouse with restaurant facilities, swimming pool, tennis courts and adjacent Medical Centre. 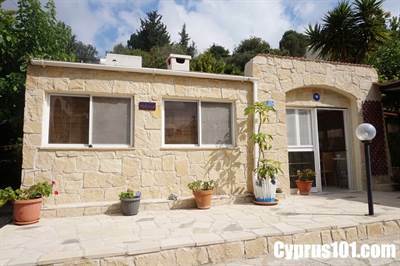 Paphos Town is a 10 minute drive away. The plot as a whole has been designed with low maintenance in mind and to the front is a large paved terrace with colourful potted plants nicely screened from the quiet residential street by a neatly pruned hedge. The entrance is gated with a car port providing shaded parking. For those looking for either a permanent residence or “lock up and go” holiday home, this unique property is a perfect option offering traditional style living in a peaceful and private setting.